For The Ton’s Spring 2017, Effie has released 18 new stamp designs and 14 new couture mixes! There are several gifts with purchases that you can obtain with this new release. This promotion does not apply to prior purchases. The threshold amount is calculated before taxes and shipping. This promotion will continue until April 15 at 11:59pm EST or until supplies last. Limit one incentive package per order. New products including the coordinating dies will be available at the shop on Thursday, April 6th! Hello everyone! Welcome to the Day 2 of The Ton’s Spring 2017 Release Week! I created couple of floral cards with our new Wishful Wildflowers and the Wildflower Banner. I achieved a very bold look with one card, and another with a soft watercolor look. I can’t wait to share them with you so let’s get started! Here ‘s the first card! I had so much fun creating this card using our new absolutely beautiful Wishful Wildflowers stamp set. I achieved a very bold yet clean look by coloring with the Copic markers and adding more details with color pencils. I started the card by stamping the Wildflower images on a smooth white cardstock in our Copic friendly Caviar Hybrid Ink. Then I drew in the frame around the image using T-ruler and black journaling pen. I colored the images with Copic markers. I don’t really have usual combinations when I color with Copics. I just use color chart and grab colors as I need them. When I was done with coloring with Copic markers, I decided that I needed little bit of that oomph! And that’s exactly what I did with the color pencils. Color pencils add so much more depth to the image, because the sharp tip could add so much more fine details. When I was done with that, I still thought I need something more, so I grabbed few gray Copic markers and added some shaing around the images and the frame. Then I stamped the sentiment in Versamark on a strip of a black cardstock and heat embossed in white. For the “hello” sentiment, I die cut our Hello Word Die 5 times on a black cardstock and I glued them all together. I adhered the colored panel on a white A2 cardbase and then the sentiment strip as well as the word die cut. I finished the card by adding some Glass Slippers Round Confetti and Dew Drops. For the second card, I used our new Wildflower Banners stamp set, and I went with the softer watercolor look. I stamped the Wildflower Banner image on a watercolor cardstock in Versamark and and heat embossed with the Silver Pearl embossing powder. Then, I watercolored the image with the Mijello Mission Gold watercolors. When it was completely dry, I added Perfect Peal + water and splattered all over the panel. When it was bone dry, I die cut the panel using the largest die from the Double Stitched Small Rectangle Dies. To create the background panel, I ink blended Orchid Crush Dye, and the Hollywood Star Dye ink on a Bristol Smooth Cardstock cut down to 4.25″x5.5″. I also added some shimmer with the Spectrum Noir Clear Sparkle Pen. I adhered the background panel on white A2 card base. Then I adhered the watercolored panel on top, using the fun foam. I finished the card by adding some sequins from our new Pink Diamond Couture Mix, Pretty Petals Couture Mix, and the Glass Slippers Round Confetti. 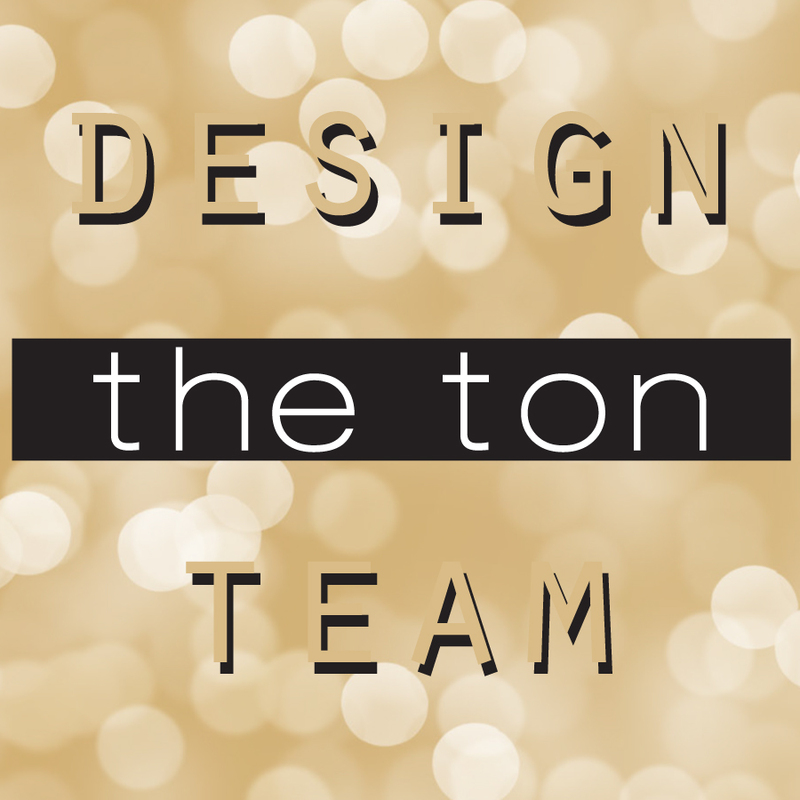 Hope you join us for the April challenge at The Ton’s CHALLENGE BLOG! To participate in our challenge, create a paper crafting project based on the theme “Anything Goes”. Enter your card by April 30, 2017 by 12:55pm EST. I hope you enjoyed today’s projects. Don’t forget to return tomorrow for the Day 3 of our Spring 2017 Release Week! Two completely different colouring techniques, and two amazing results! Love the bold colours of the first card – and your colouring of the petals is simply perfection! The second card is more delicate and “dreamy”, but also so gorgeous! Thanks so much for sharing these beauties! Beautiful coloring on your gorgeous cards! I love the vibrancy of your colors. Very pretty. Love your bold colors on your first card. So vastly different – from the eye-popping white to the vivid pastels, yet I love ’em both!! These cards are stunning – that bold color with the black and white is just gorgeous and might be my favorite. But that softer watercolor card is just beautiful too. I can’t wait for this release! design. The coloring is fantastic. Your cards are so different and both so beautiful. Your coloring talent is awesome. Love Copics and your amazing bold colouring of the Wishful Wildflower card. Love the coloring for the wildflowers card! Your first card just blows me away! Great skills and creativity! The colors you used really showed off the beauty of the stamps. Thank you for sharing. Wow!! Your first card is stunning. Love your coloring of the flowers. What nice cards. Thanks for sharing. Your flowers on that first card with the black edging really pop – lovely. These are both so gorgeous! I can’t choose a favorite! LOVE the watercolor card! So pretty! oh my goodness, the coloring is awesome! the colors are so pretty and vivid! Beautiful colors and so totally different coloring. I love the watercolors! Gorgeous cards. Love the wishful wildflowers and the beautiful colors you used. So pretty. Love your color choices on your cards. Beautiful cards! Your coloring is absolutely gorgeous! Both of your cars are beautiful – soft and bold. I especially love the boldness of your first card, stunning! Wow your cards are beautiful. These cards are so fabulous!!!! LOVE. Stunning cards! Love the awesome designs & wonderful colors! I need this stamp set!! Your choice of different medias really highlights the difference for how the card can catch the eye the copics are so vivid and bold and the colors so unique and love love this card..then your soft watercolor effects with the second card with the sparkles. Love both of these cards but especially the first one!! The colors are so intense and beautiful!! Amazing coloring on these gorgeous cards! WOW what different cards we have on show here, i love the bright colours from the frist card but that stamp is so devine from the second card, in which i hope ends up in my craft room one day. thanks for sharing. Your floral cards are beautiful! They’re both unique in their own way. I like how the first one leaves some white space, where the flowers aren’t over saturating the card. The highlights give a nice pop, like the flowers just bloomed. So lovely! I love the layout of the flowers on the first card! Your wildflowers are so gorgeous and the shading is amazing!